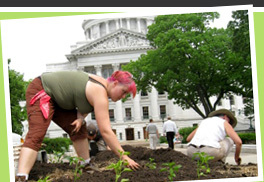 MADISON — Community Shares of Wisconsin (CSW) today announced it will host the 2016 Big Share™ on Tuesday, March 1, to benefit 70 local nonprofits that are building a fair, just community and protecting our environment. The Big Share is a 24-hour online fundraising event in support of Community Shares’ nonprofit groups. Now in its second year, The Big Share is an easy, flexible way to donate to and learn more about organizations that help our community. From a single web page, donors can select from among all 70 nonprofits and direct their gifts to the causes they care most about. Community Shares launched The Big Share in 2015, collectively raising over $232,000 from 1,750 donors. CSW member nonprofits raised much-needed funds to support their missions, while also increasing their skills and knowledge of online fundraising and social media outreach. Cash prizes from local businesses will offer nonprofits and donors a way to increase the impact of any single gift. This year’s business partners that are offering incentive prizes or hosting special events throughout the day include Mini of Madison, ZenDesk, Home Savings Bank, Delta Properties, National Guardian Life, MG&E, Sprinkman Real Estate, Madison Community Foundation, Supranet, Plan B, Java Cat, Yelp and others. The Madison Community Foundation will again serve as partnering sponsor of The Big Share, contributing both funding and leadership. A key reason for the success of The Big Share is the training and technical assistance offered by CSW to its member nonprofits in the areas of online fundraising and social media campaigns. CSW can provide this, thanks to sponsorship from MG&E and a generous grant from The Evjue Foundation, which supports CSW’s long-standing partnership with the UW-Madison School of Journalism and Mass Communications. Student interns from that department, as well as UW staff, provide additional expertise and support to CSW and its members. Furthermore, UW-Madison students receive real-world experience in strategic communications and project evaluation. Community Shares of Wisconsin is a member-directed fundraising federation; all of its member groups hold a seat on the CSW board. CSW raises money through workplace giving campaigns, the Community CHIP® program at Willy Street Co-op, and the Round Up program at Capitol Centre Market. Community Shares not only raises money for its groups, it actively helps expand their capacity through training, 1:1 support from experts, networking, and technical assistance. Madison Community Foundation encourages, facilitates and manages long-term philanthropy. Since 1942, the foundation staff has helped people realize their philanthropic goals, allowing them to support charitable interests anywhere in the world. The community foundation also awards grants throughout Dane County to build communities. More information is available online at www.madisoncommunityfoundation.org.